The NEW boat market has gone to outboard engines. Due to the age issues of the now old pilothouse vessels I specialized in, and their buyer demographics (delusional expectations to the conditions of old boats) who seem to have zero interest in cruising in clear waters-combined with the ever increasingly difficult task of getting these old boats through a successful survey, that UNLESS you are a customer for a large (50′ up) later model yacht to be used on the oceans – I’m now retired. I never hope to hear the word “loop” again, unless referring to a belt. I would like to thank all my past clients who are still alive for making these past 45 years a fun experience. It was a good run. May the wind be at your back. Cheers. There’s no way for me to just ‘turn off’ this site, so I guess it will just remain online. Parting advice: Hire Bill Gladding from Jacksonville Florida as your surveyor. He know’s boats well, and he does travel. It will be the best money you’ve ever spent. 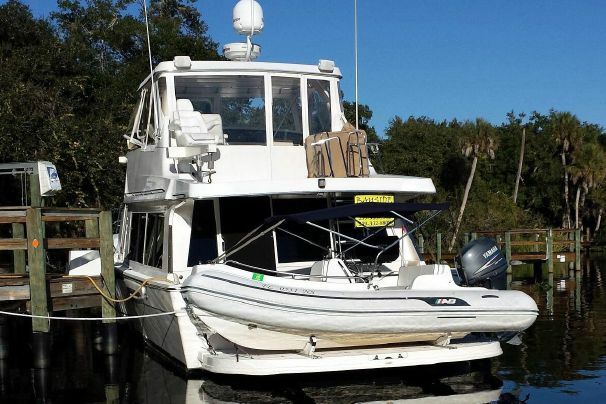 That said-it would behoove you to have OIL SAMPLES pulled BEFORE you go to the expense of visiting any boat that has the 330/370hp Cummins engines, much less actually going to the expense of hauling and surveying to only later discover it needs new engines. I’ve had customers replacing these engines for over 15 years now, but those boats with the new engines aren’t yet for sale. When they need new engines-they will be. OLD Taiwan built boats were price boats when new, and had serious rot issues when just a few years old never mind who built them, and how much they cost new-and that includes Grand Banks. 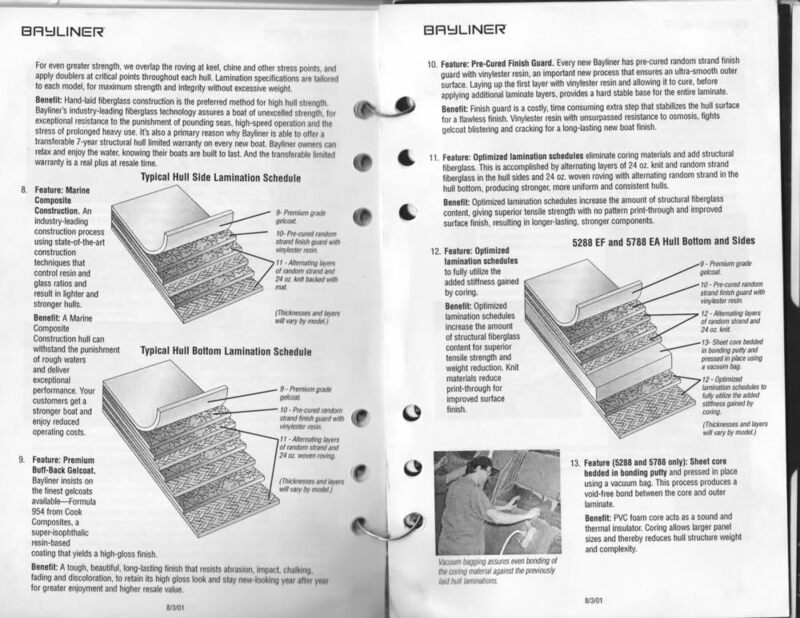 By the late 80’s -early 90’s people were properly restoring them by completely cutting off the deck and superstructure to replace the metal fuel tanks, stringers, electrical wiring, iffy Taiwan stainless steel, then properly rebuilding the deck and superstructures out of fiberglass. There’s only one way to do proper restorations. Would you buy a car as old as the boat you’re looking at? Why not? Does a car sit in a corrosive environment 24/7? 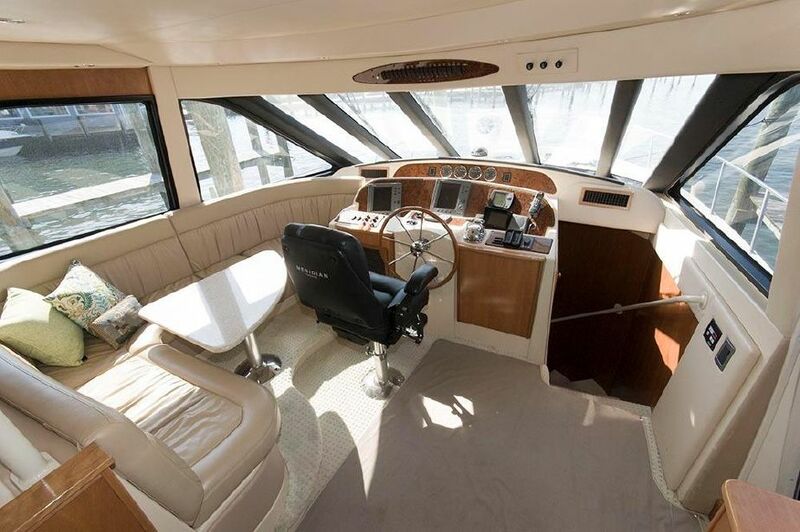 For those seeking info on the Bayliner 4788 Pilothouses, I recommend the BOC (baylinerownersclub.org). Yes, I have sold well over 40 of them, but that was back when they were either new or ‘not that old’. NOW, the newest 4788 is 17 years old, the newest Meridian 490 is 11 years old, and they’re suffering typical old age issues (leaks, corrosion, worn out machinery), which makes them rather difficult to get through survey, especially engine surveys. Remember: these were price boats when new. Most now seem to be falling into the Project Boat Category – which isn’t my cup of tea. 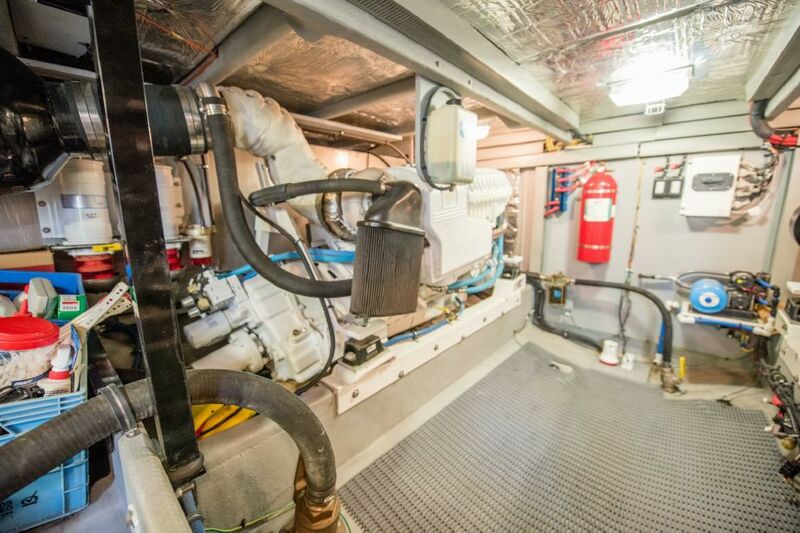 I’m seeing 4788’s with the Cummins engines selling for $45k-$75k – with no hull damage- but needing engines (that includes generators) and total refits. 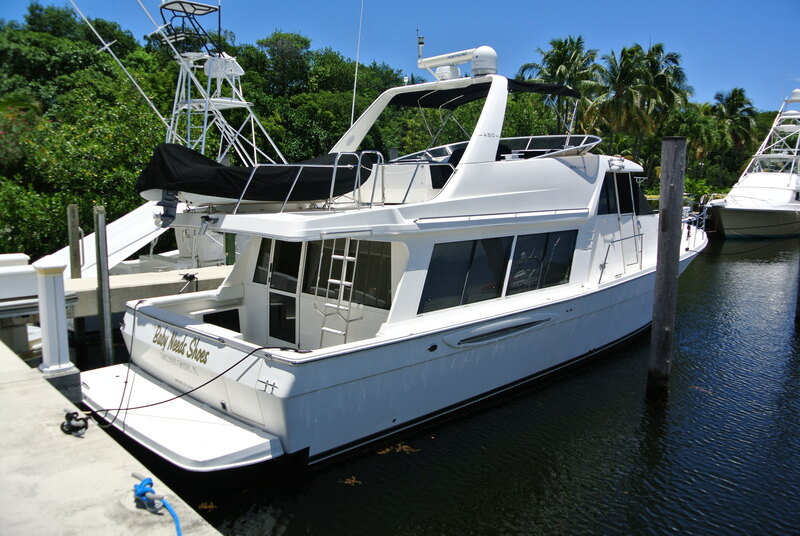 Nice one’s that have been totally refit (but still need engines) are selling $135k-$180k. Again -“not my cup of tea”. SADLY I’m now seeing the same problems of the 4788’s but with way worse aluminum corrosion issues on the later model Meridian 490’s. YIKES, not good. The 5288’s(540’s) and 5788’s (580’s) are fine, nice one’s are selling from $189k-$300k on the East Coast. MERIDIAN INFO is below- Keep scrolling. I have never marketed junk, but know there’s a LOT of junk out there. Don’t think you’re safe because the boats you’re looking at on the West Coast of the United States haven’t been storm damaged. MANY were trucked west and also well up into Ontario Canada. 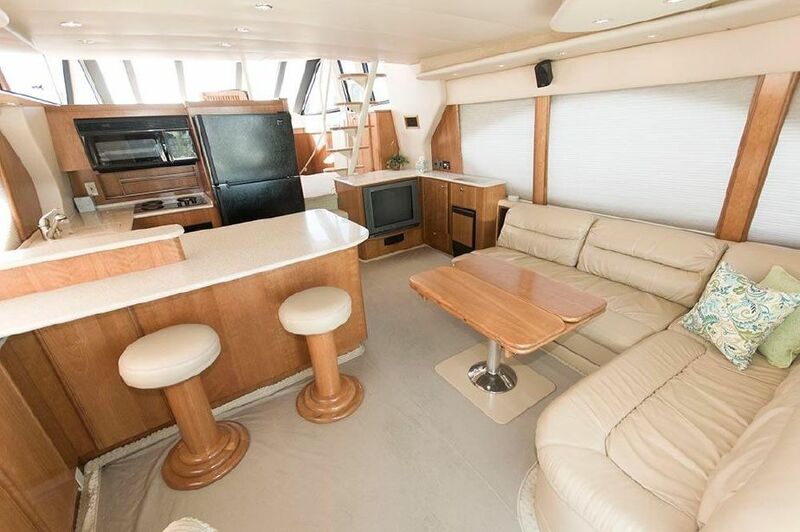 A 2007 Meridian 490 was sold in Oregon represented by an unscrupulous Oregon broker as “freshwater, boathouse kept boat from new”.. Aluminum window frames were totally SHOT through with corrosion because it was really from Pensacola Florida. Yeah -it’s like that. 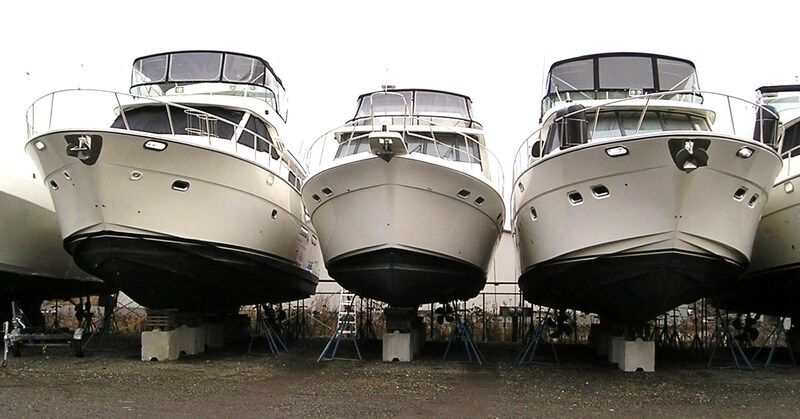 Bayliner 5288, 4788, and 5788 all lined up together. For all practical purposes the Meridian Pilothouses look exactly like these, with the exception of the shapes of the portlights, salon windows, frames are now white, and new air intake covers (490). Both marques were built in the same Washington State factory by the same workers in the same moulds. Getting rather ‘long in the tooth’ now. 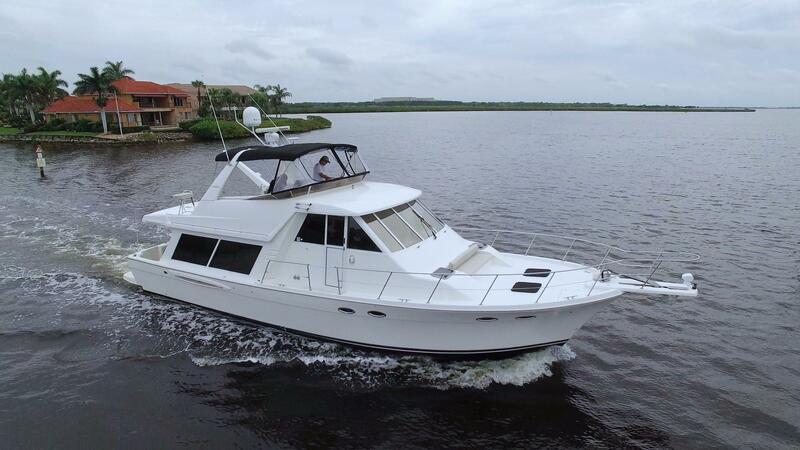 Meridian 580 Pilothouse Motoryachts. NO latent defects. 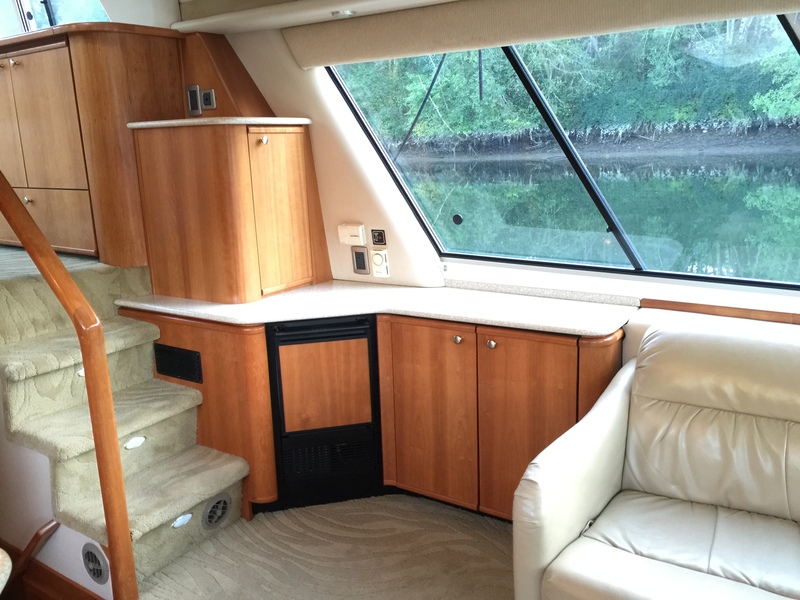 If you can find a 2002 Bayliner 5788 with the Cummins engines, and the high gloss cherry wood, buy it, as they’re as rare as the proverbial unicorn or common sense. 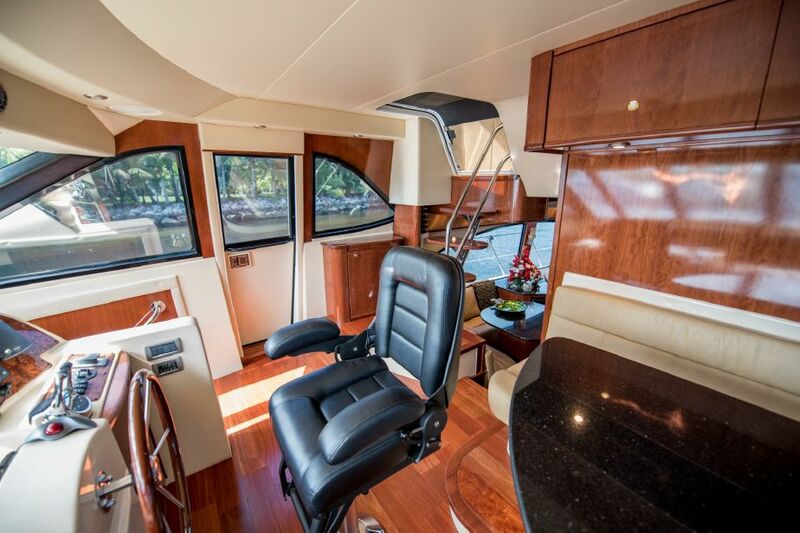 A gorgeous 2010 Meridian 580 I sold (100% sight unseen by her buyer) in Costa Rica after cruising down from Alaska. She was loaded on a ship to Australia. The buyer sent me the funds and said “find me the best boat out there” and I then went boat hunting, and found him a jewel. Americans couldn’t compete with these foreign buyers who sent funds first, making me their buyers agent for quick cash closings. I don’t have to “think about it” or “consult with the wife”. I pull triggers. Of course in 2010 most Americans were hunkered down hoping not to have their homes foreclosed, and not out buying yachts. 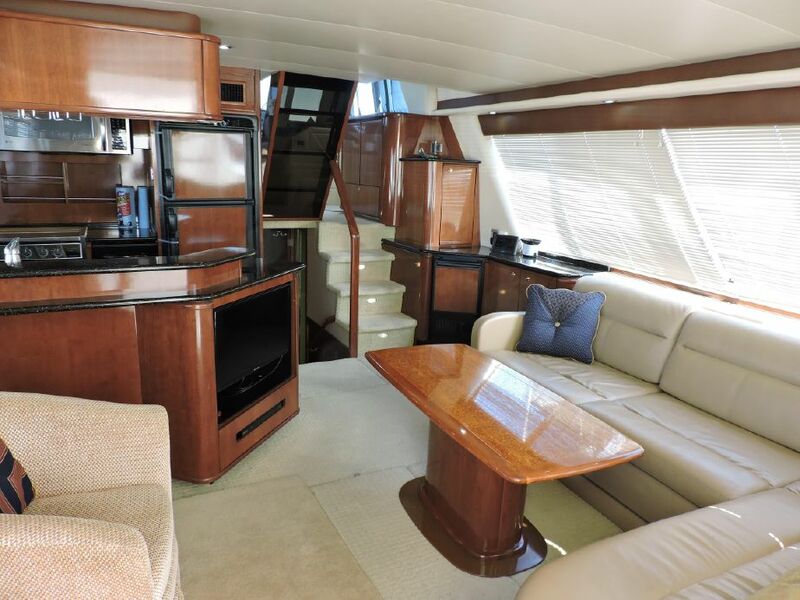 This is a 2010 model Meridian 580 (although the hull was laid in 2008) The fit and finish of this yacht was spectacular. 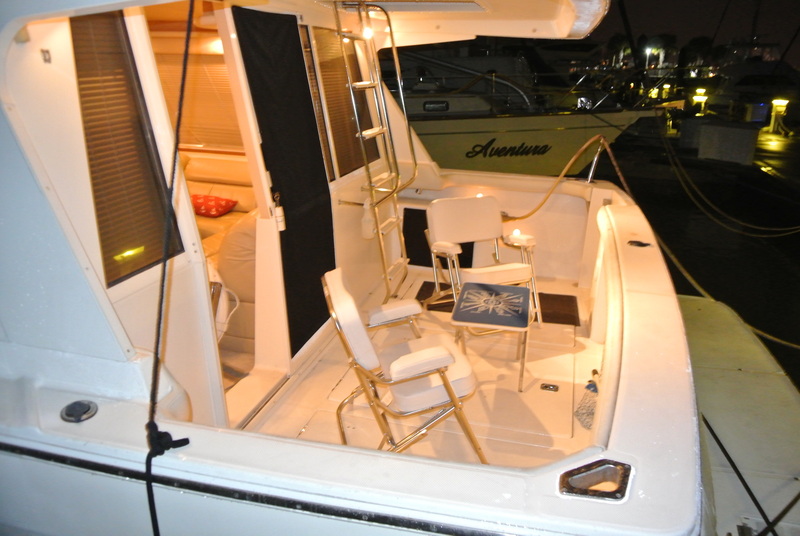 2003 Meridian being introduced at the Miami Boat Show. 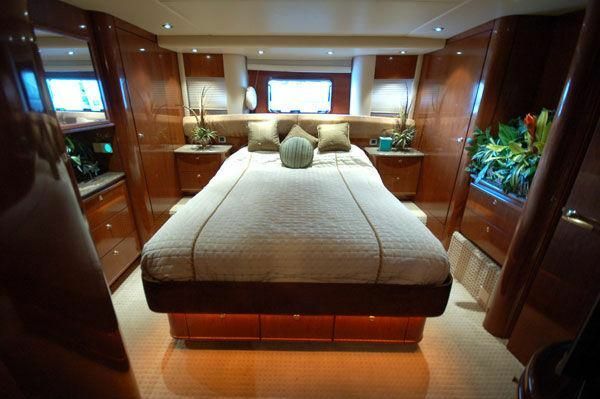 Master Stateroom of a 2007 Meridian 580 with custom escape window. 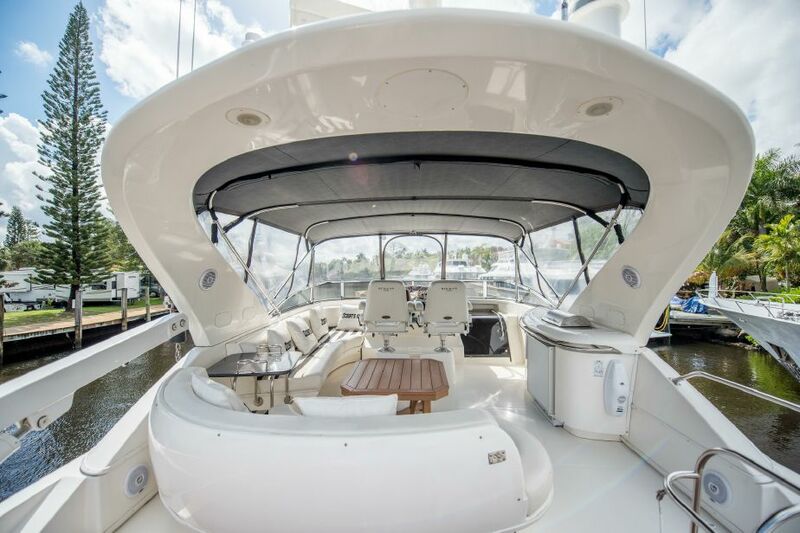 A 580 with a nice custom cover over the foredeck lounge area. These vessels have plenty of room for large tenders, and have a hydraulic davit that extends, swivels, goes up and down by remote control. 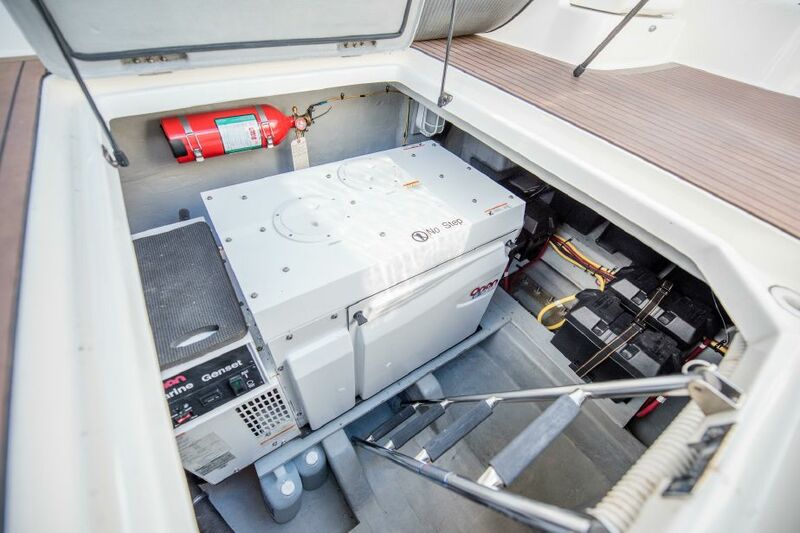 These really are quite the high-tech built yachts, as Brunswick, even on their Bayliner Pilothouse series was one of the first boat builders to use cam controlled laser machine tools. 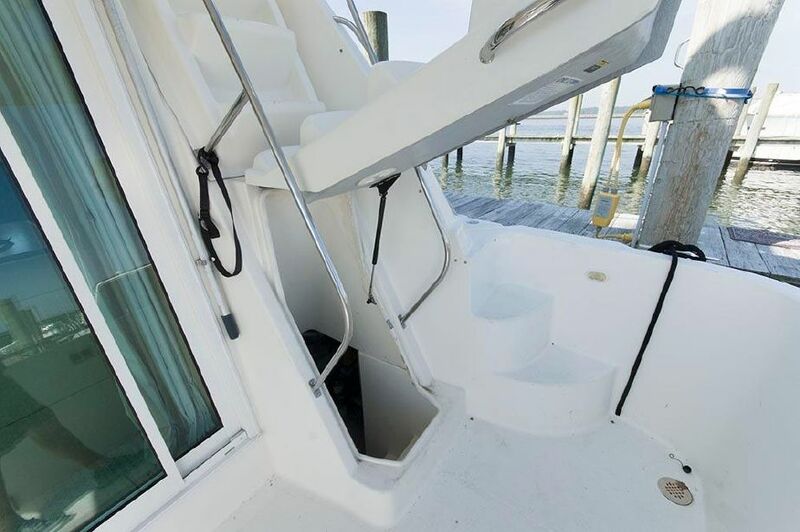 All models use a unitized construction process; load-bearing bulkheads are bonded to the hull and deck to provide a yacht that is stronger and more durable than most boats today. Longitudinal hull stiffeners give additional strength on the hull sides give additional strength on the hull sides,absorbing stress that would otherwise continue to move through the boat. 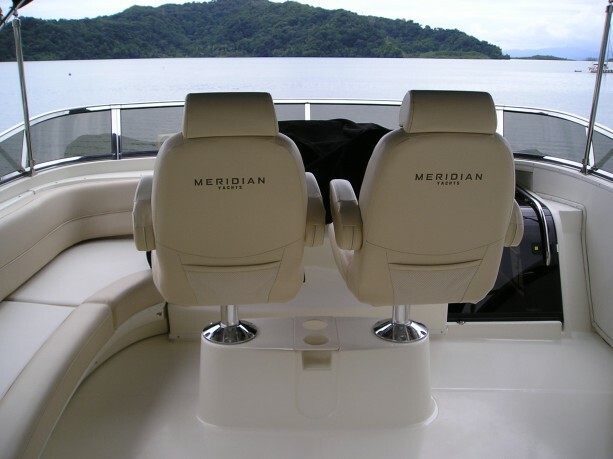 The Meridians were built in the same factory by the same workers in the same moulds used to build the Bayliner Pilothouse series. 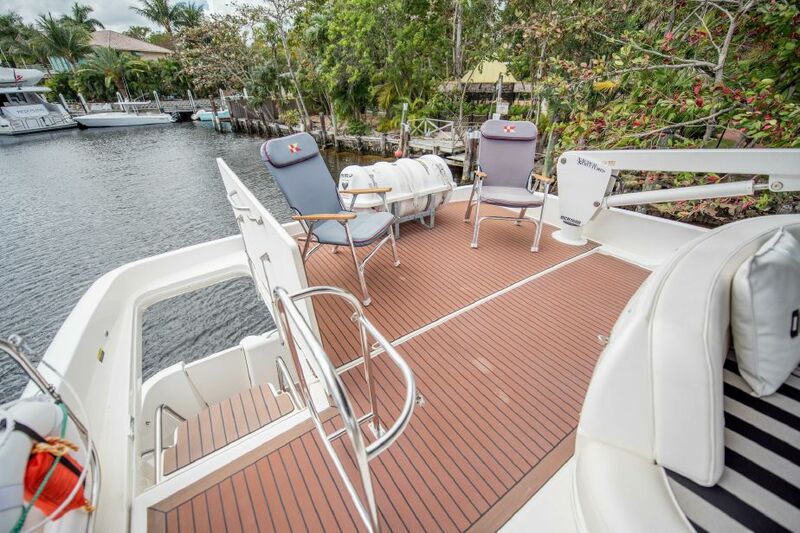 Directly from the Meridian Dealers Manual>>> Every Meridian features a precision-overlap, bonded hull deck and joint that forms a tight seal against the elements. Stainless-steel through-bolts further strengthen the joint. 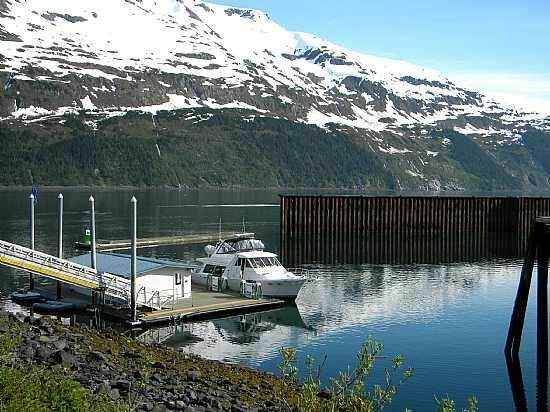 MOST importantly they use a Vinylester barrier coat which prevents water from penetrating the laminate, minimizing the risk of blisters forming on the hull. 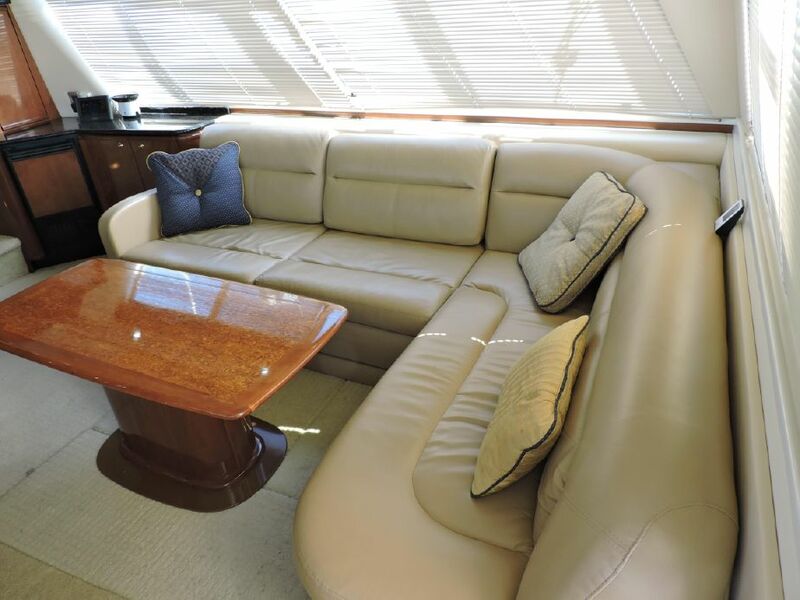 During their fiberglass construction process, each part is hand laid by skilled craftsmen using heavy-grade 24 ounce woven roving and biaxial stitched fabric, hand rolled and finished between alternating layers of strand. This ensures superior strength while providing a mirror-like exterior finish. 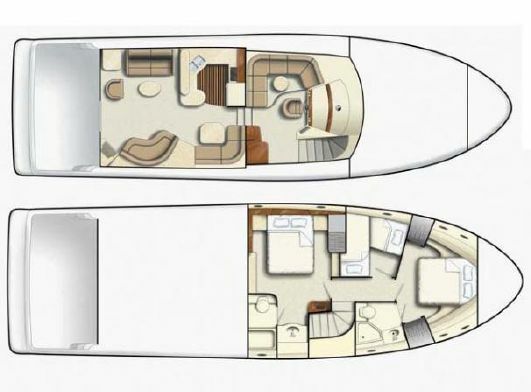 It also allows them to offer a 10 year structural hull and deck limited warranty on the Meridians. They use the finest pre-cured gel coats for a uniform, high-gloss finish that stands up to the toughest elements. Their boot stripes outlast taped stripes because they are incorporated in the gel-coat. Engine beds with transverse crossbeams reduce vibration and add strength. These structural engine mounting transfer the weight, torque and thrust of the propulsion system to the structural components of the hull. NOTE: the salon superstructures, doors, window frames, pilasters are made of Aluminum. This is another reason these boats have a low center of gravity, and as everybody knows; aluminum is very strong and light. 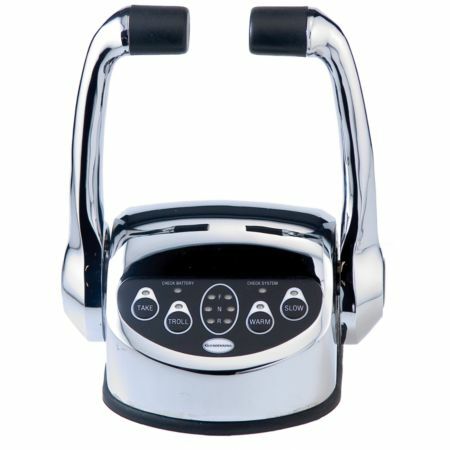 Pretty high tech for a low priced yacht isn’t it? 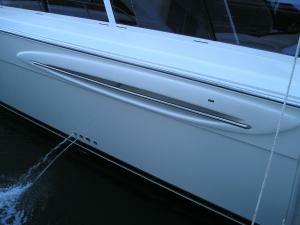 This is also the reason why the salon windows don’t leak or crack on the Meridan pilothouse models. 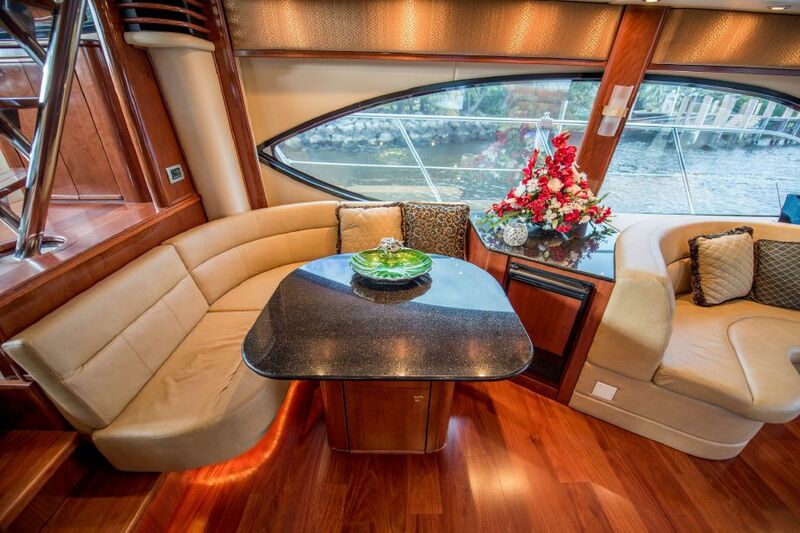 The window frames are not supporting the weight of the flybridge as are other marques. 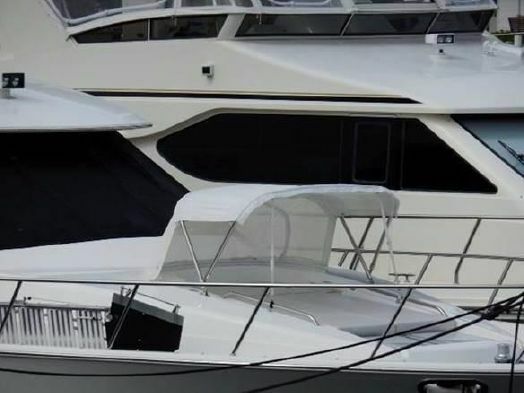 Because in many other brands it’s the window frames alone structurally supporting the flybridge, which is why they continually have windows crack as the bridges bounce. NOT the Meridians- they have a strong aluminum structure, AND strong window frames. Aluminum is subject to corrosion if not properly zinc treated, and especially if salt is allowed to build up. Proof of how thick these boats are built. 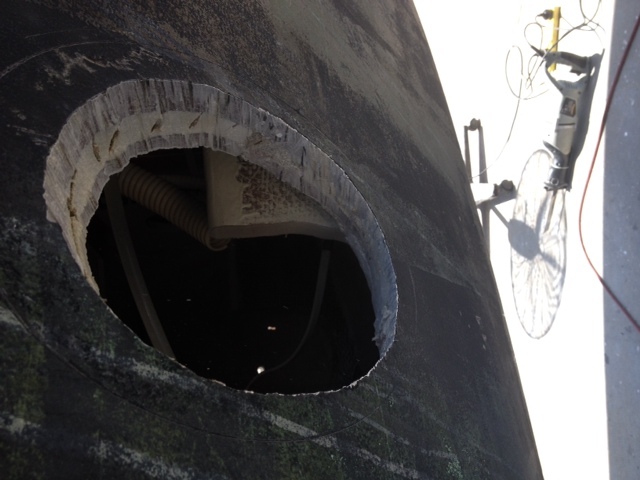 This is the hull of 2000 model 4788 that sat being pounded on a reef in the Bahamas for a week. She was craned onto a barge and brought back to the States, rebuilt and is out there somewhere. I lost contact with her in Daytona Fl. 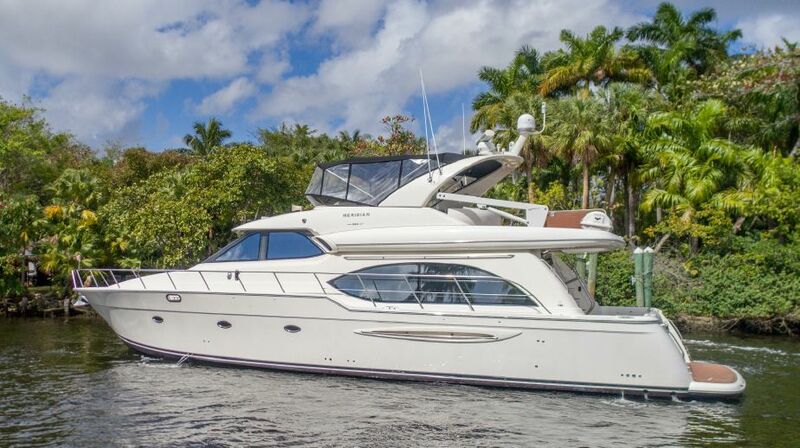 There’s no Car Fax for boats, so it’s good to know the provenance of vessels because some owners and brokers LIE, and this boat is somewhere out there. If I’m provided with the original name of a vessel, my memory can tell you it’s history. Another view. 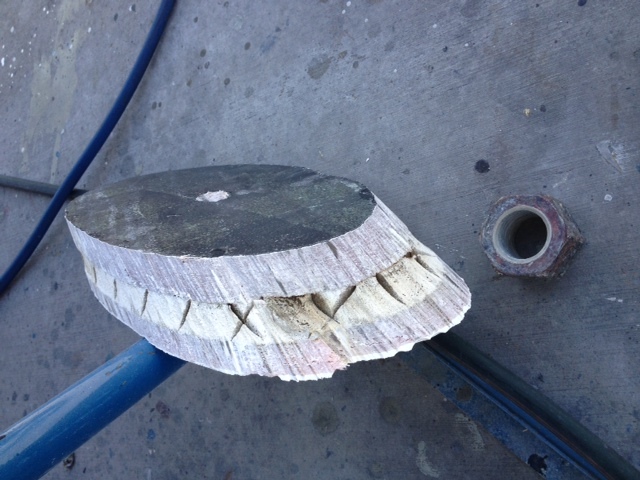 The outer layer alone is thicker than many so called “quality” yachts entire hull thickness. 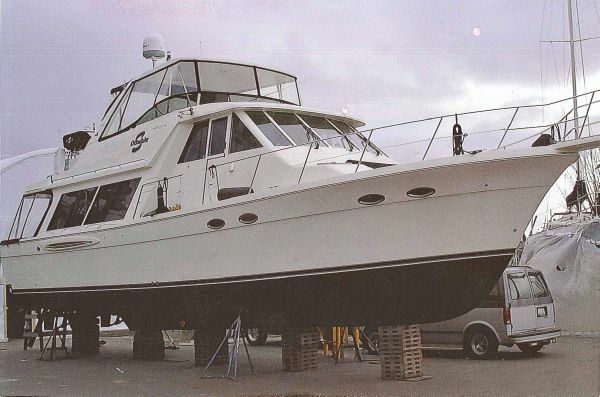 Meridian 490’s are just a continuation of the Bayliner 4788’s so it’s safe to assume the construction layups are the same as below. 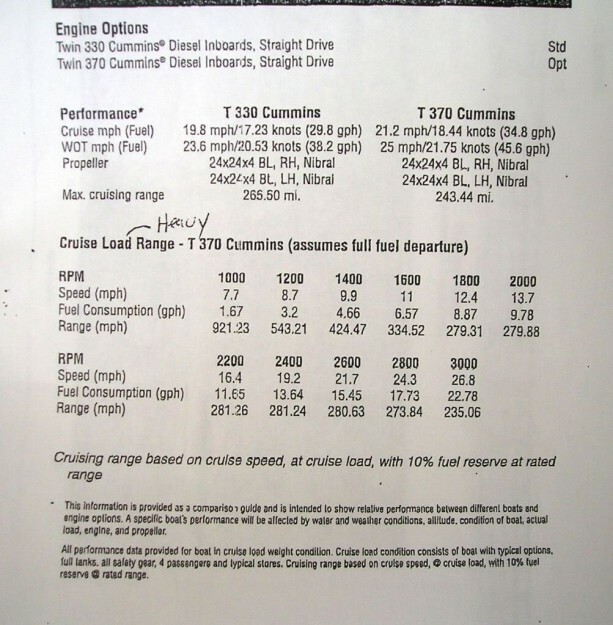 The Cummins QSM electronic diesels of the 2007-2010 model years in the 490’s got BETTER fuel mileage than the mechanical engines, do not smoke, and are quieter.
. In related fact- The owner of the “Barbara K” (99 4788 w/370’s) cruised down from Charleston SC to Miami for loading on a ship to New Zealand, and she burned exactly 180 gallons of fuel. His speeds varied, running both in the open ocean and Intracoastal Waterway. You should expect similar burns from Meridian 490s with these engines. FUEL BURN Cummins 330 hp. 1600 RPM = 9 knots 3.9 gph each= 7.8 gph = 1.15 nmpg. 2800 RPM= 22 knots 17.4 gph each=.34.8 gph=.63 nmpg. Disclaimer: Your results may vary. That’s a pretty impressive range. The nice thing about a 4788 is you can go slow, OR if you feel like it-you can get up and GO. 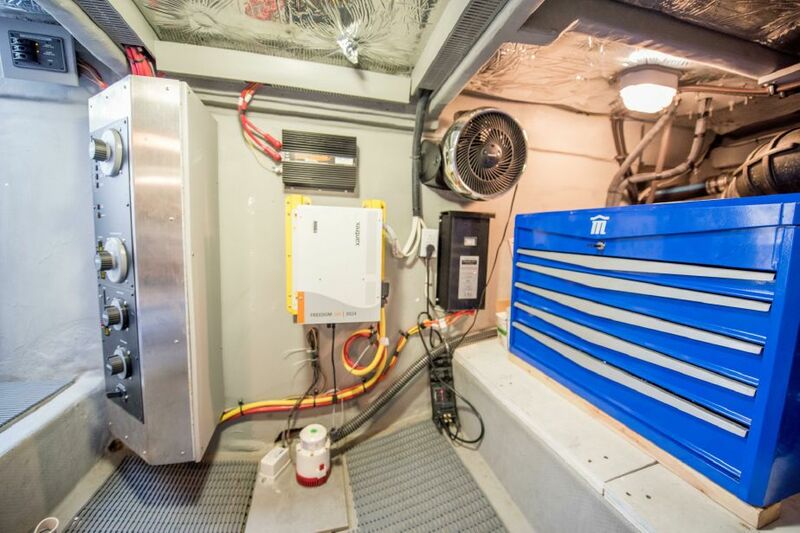 These boats came from the factory pretty well equipped with standard items that most manufacturers would call options such as 330hp Cummins, 8kw gen, 4 electric heaters, electric davit, w/icemaker in main salon, fully equipped galley w/trash compactor, microwave, etc, canvas covers, electronics package w/Autopilot, Gps, radar, Vhf, TV/VCR, stereos, electric windlass,etc. 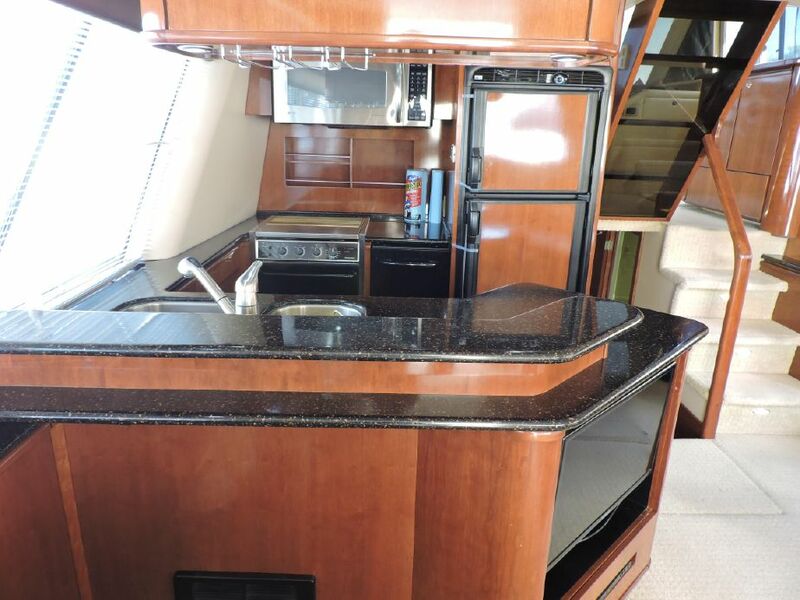 All have Bronze shaft struts and rudders, Bronze Seacocks, color coded wiring, Racor filters and top of the line appliances, machinery and equipment. MERIDIAN 540 built from 2003 – 2005. LOA: 54′ Beam: 16’03” Bridge Clearance:19’03” Headroom: 16’07” Dry Weight: 50,554lbs. 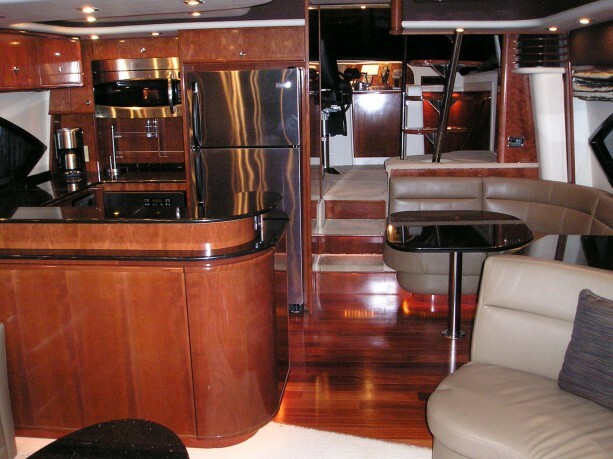 these larger yachts give a real “yacht feel and ride“. 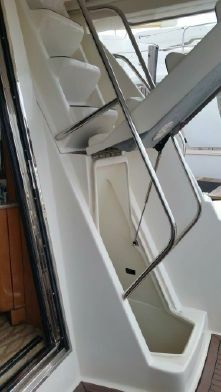 The engine rooms are accessed from the cockpit via hinged stairs to the flybridge. The headroom and space in these engine rooms is excellent. Incredible amount of storage in the lazarette, and in the hollow swim platform. 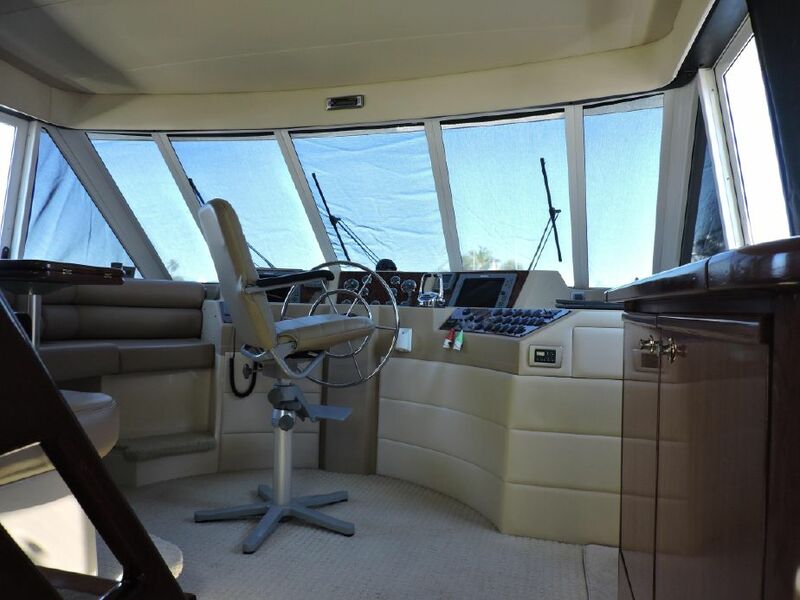 Meridian 540 Pilothouse. 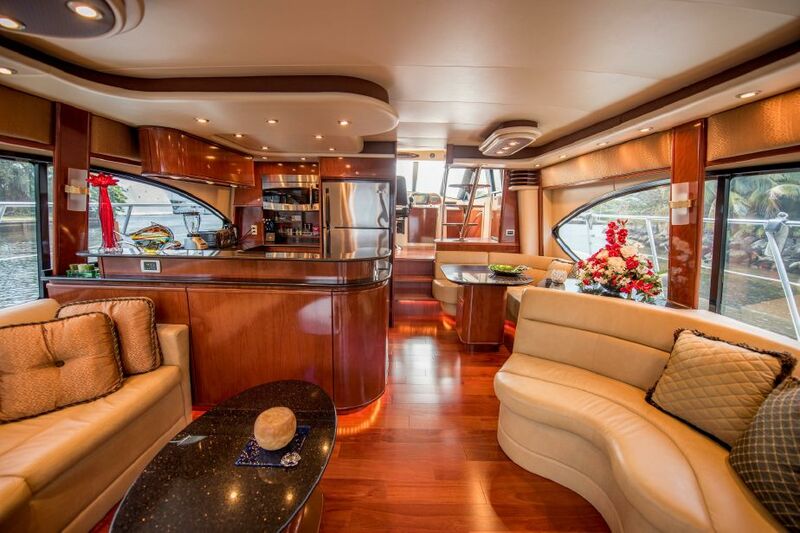 Note that there is no port side pilothouse door. 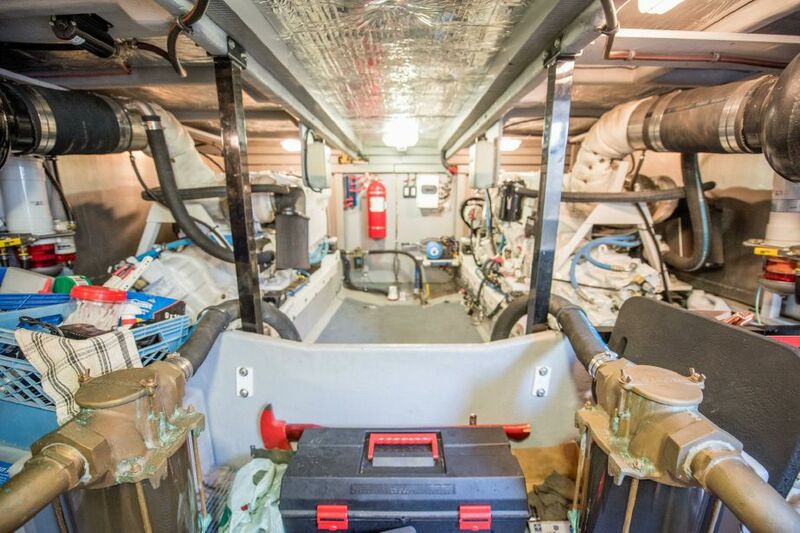 Engine room access on a 540 Meridian. 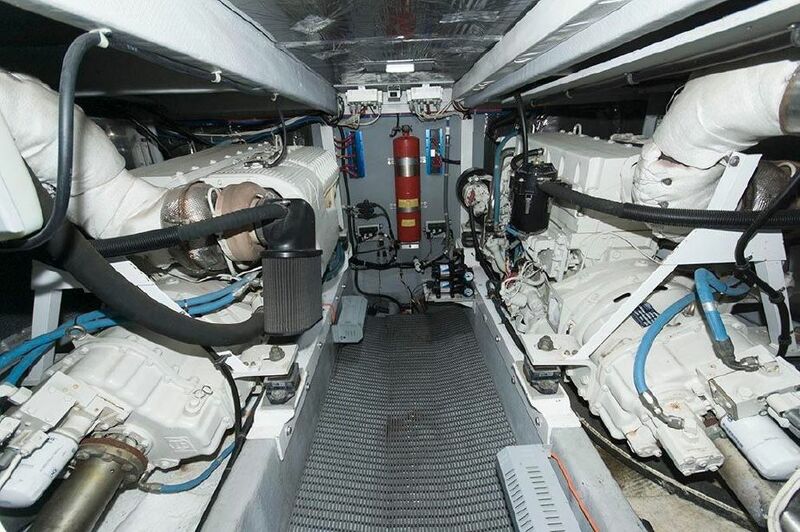 The Cummins QSC electronic engines used in the Meridians have a smaller footprint than the MAN diesels used in the 5288’s. 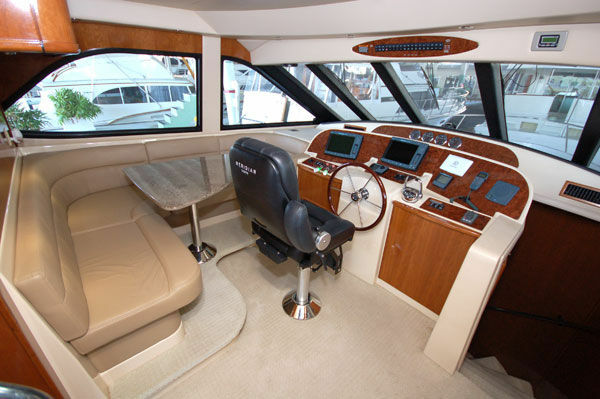 The flybridge of a Meridian 540 Pilothouse. 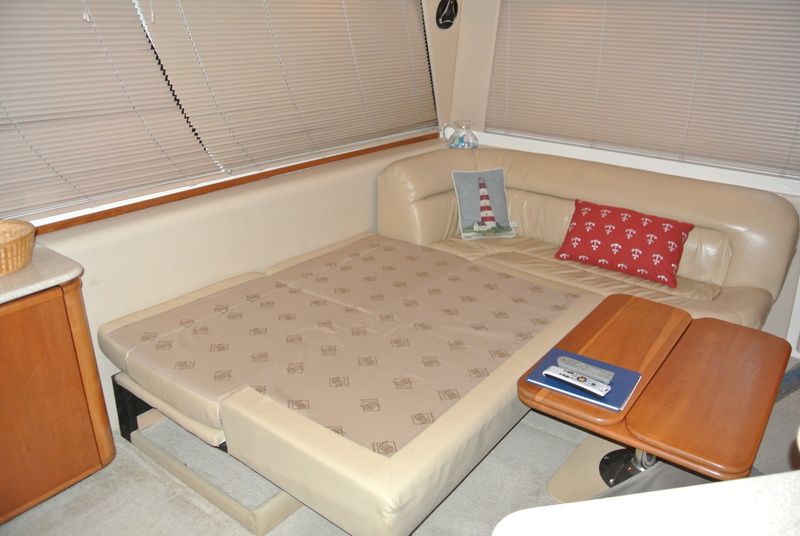 MERIDIAN 490- built from 2003-2008 – ISSUES. The 490 has the same features we all liked on the 4788’s. 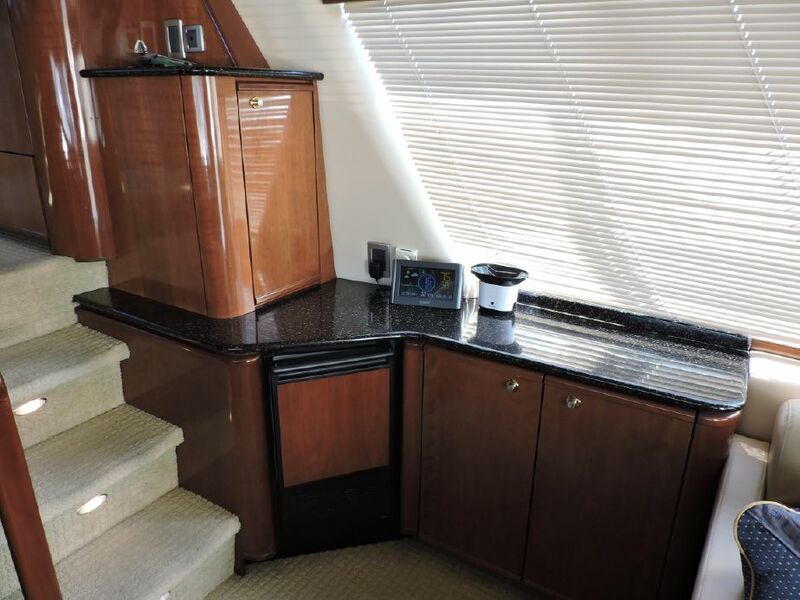 In the later part of 2004, in a huge improvement, they made an engine room access hatch in the salon sole BETWEEN the engines in addition to the standard entrance via the companionway stairs. On flip side of that improvement- they eliminated the storage under the L-shaped settee, which is odd. There’s nothing in there, they just installed modular seats that do not open up. I’m sure a good upholstery shop can rectify this. On the 4788 this L-shaped seating areas is one of the storage area’s for bulk goods, and is also a popular place to install an inverter, being that the batteries are (offset) below this space in the lazarette. I’m very disheartened by the time (oldest one is now 16 years old and the newest Pilothouse is now 11 years old) related issues I’m now discovering in the 490’s only- I’m NOT seeing these issues in the 540’s or 580’s.. For many years (past tense) these 490’s were rather immune to the issues common to the older 4788’s No longer true. What’s particularly alarming in the issues I’m discovering UNIQUE to the 490’s that didn’t exist in the 4788’s.Whereas corrosion of the exterior of the aluminum window frames did occur some (99’s-01s especially) model year 4788s. I’m seeing window frames on some 490’s that are TOTALLY shot through with corrosion so bad that they’ve lost their structural integrity. 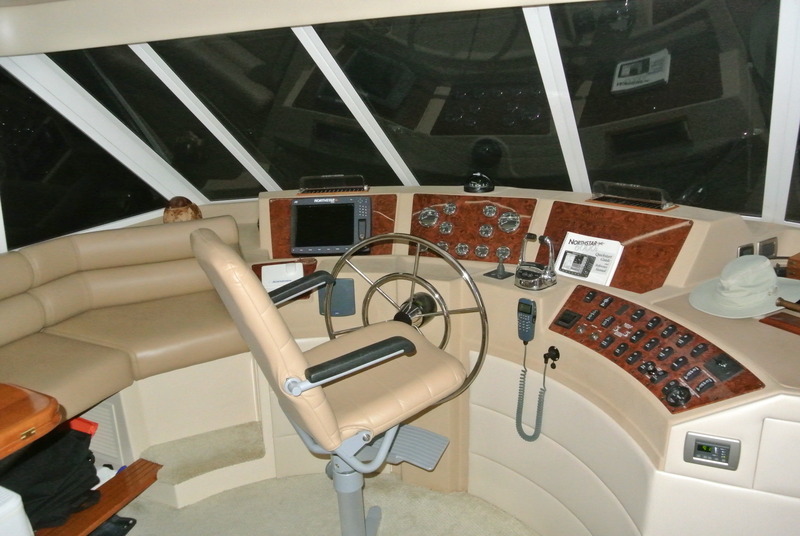 I’m seeing pilothouse windshields flex (YIKES!) 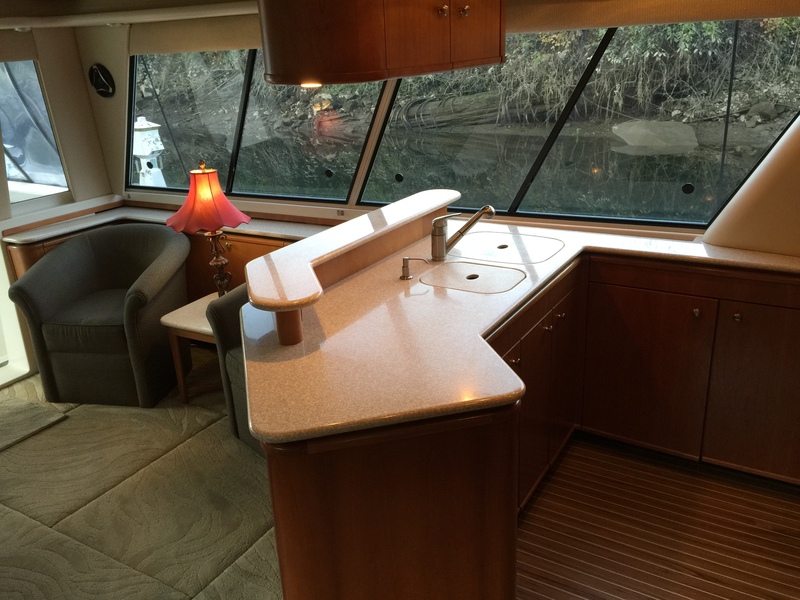 I know a 2007 490 in Oregon (misrepresented as a “freshwater shed kept boat” by unscrupulous Oregon broker- the boat was originally from Florida) that needed it’s complete window frames replaced. That was not an easy or inexpensive job. 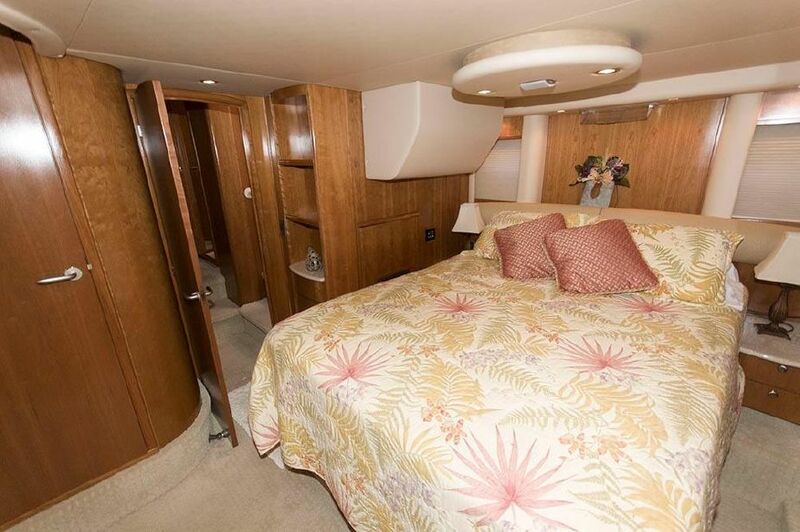 .I always knew of the dry rotting plywood that was laminated to the hull- inside the lazarette when NEW. This issue was repaired by the dealers when new- IF caught. 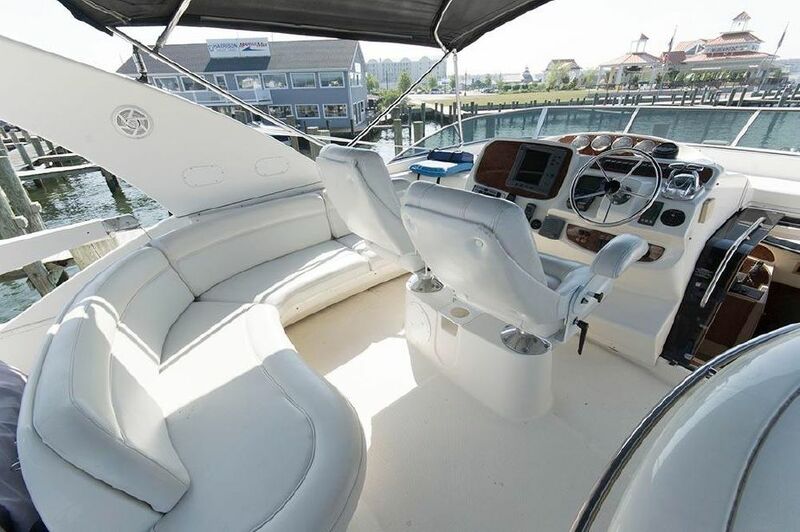 Of course there were several Meridian Dealerships that went out-of-business in 2008, that still had new unsold boats from early years still in their inventory (especially Alameda Ca.) which were liquidated by National Liquidators or given to other dealers to sell. It’s safe to say- that those boats never had the needed repairs when new. NOW here we are 11 years or more later, and the rot on those boats has spread to under the generators (frames are also rusting away) and under the companionway to the staterooms from the salon. 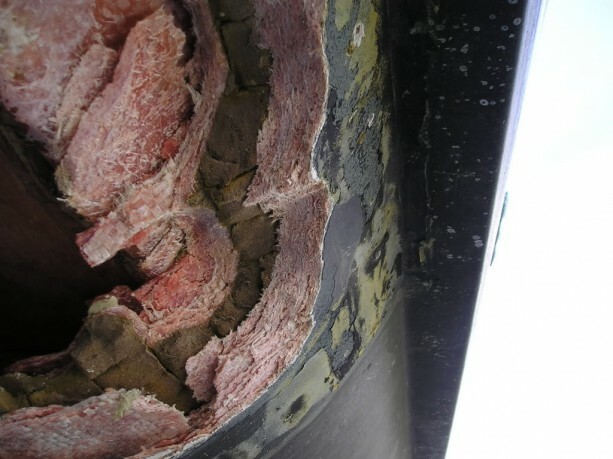 The bow pulpits are cored with plywood, and I’m also seeing rot there (like the 4788’s) too. The foredeck under the pulpit, and windlass are also showing softness from water egress-the same as the 4788’s. I’m seeing leaks in the salon, galley AND in the pilothouse in places that the 4788 never leaked at all. The drain hoses and pot metal drains they were attached to were not of the highest quality. If the 490’s have the 330hp Cummins, then they too are suffering the same engine ills as the 4788’s. IF the props weren’t cut down aka “re pitched”. The 370’s are NOT automatically immune! The good news is that Cummins has engine swap out deals where they take out your old engines, and replace them with factory reman’s with full new engine warranties. The engines are easily swapped out, and it’s relatively cheap at $40k -$50k for two engines- (depending on the location of the Cummins Dealer) and their overhead. Price out a new engine for a Mercedes Benz AMG sometime. All of a sudden these diesels are a bargain. The good news is that 490’s are selling for half the price (or less) when they were new or even “newer”. Let me repeat- I’m NOT seeing any of the 490 issues in the Meridian 540’s or 580’s. They were excellent yachts when new, and are still excellent yachts. You DO get what you pay for. 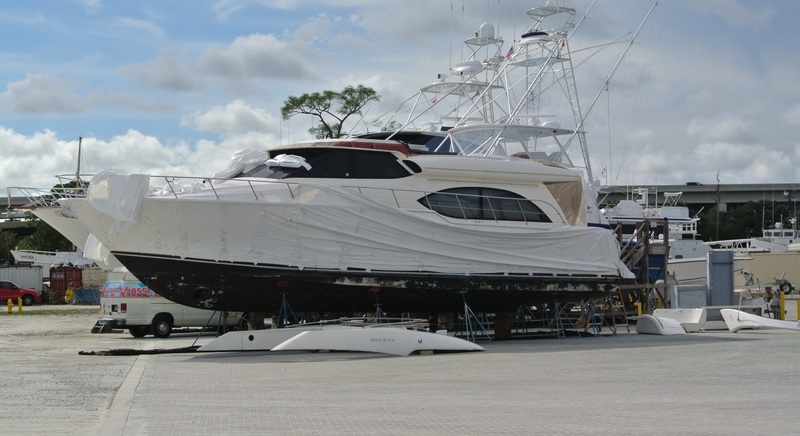 Although no Meridian 58’s or 490’s hulls were laid up after 2008, a few 490’s were given 2010 HIN numbers, as they were still at the factory in 2009, and not sold until 2010. You would have to ask the Coast Guard that ‘trick’. 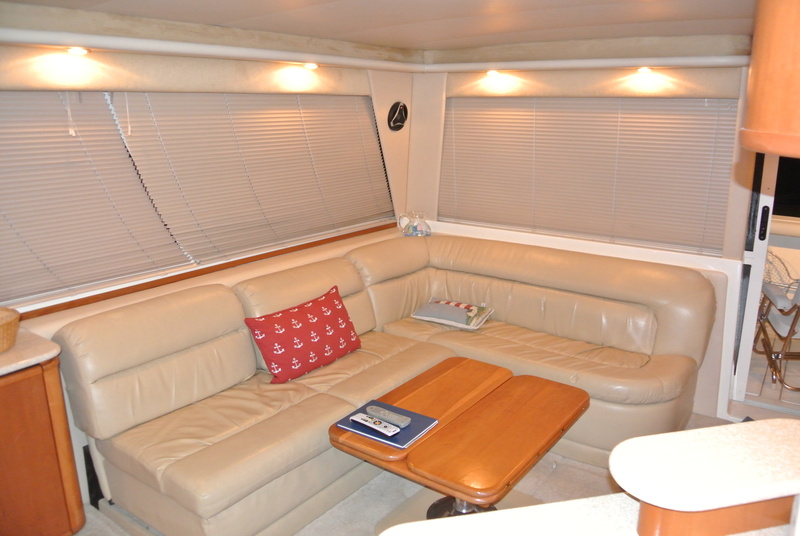 Although built in the same moulds as the Bayliner Yachts, the Meridians have different shaped port lights than the Bayliners, and the Meridian 580’s have larger salon windows that don’t open-unlike the 5788’s. 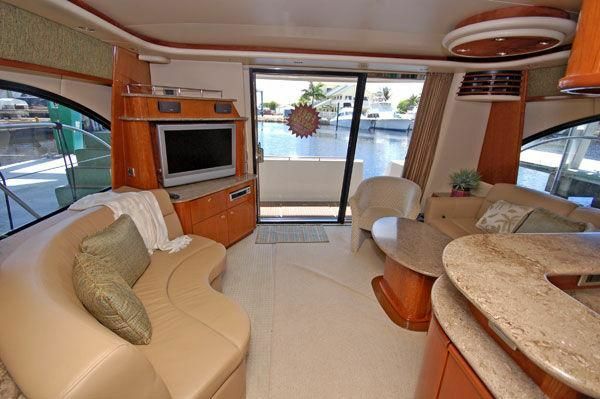 The 580 and 540 Meridians do not have port side pilothouse doors. 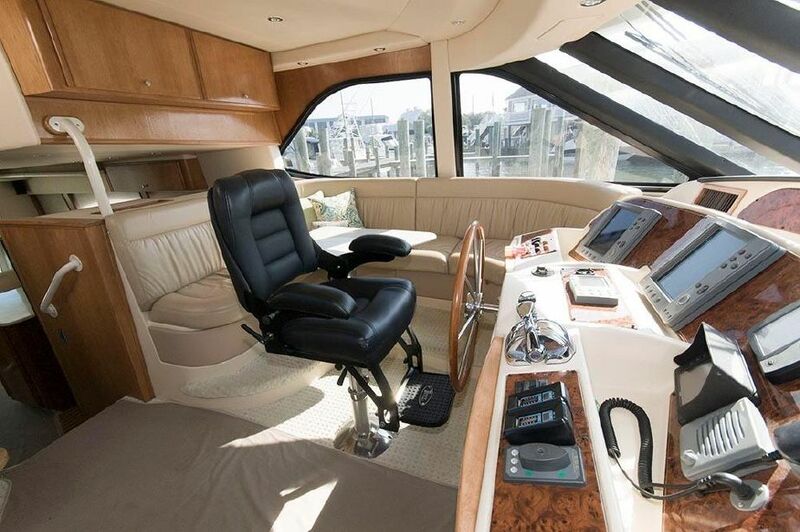 The fit and finish of the interior is richer with the Meridians, better grade carpeting, hardware, and a MUCH higher quality pilothouse helm chair, etc. Electronic Controls for the Electronic Cummins engines on QSM serie’s of diesels. The Meridan 540s and 580’s had this as early as 03, but the 490’s didn’t have electronic controls until late 2007. 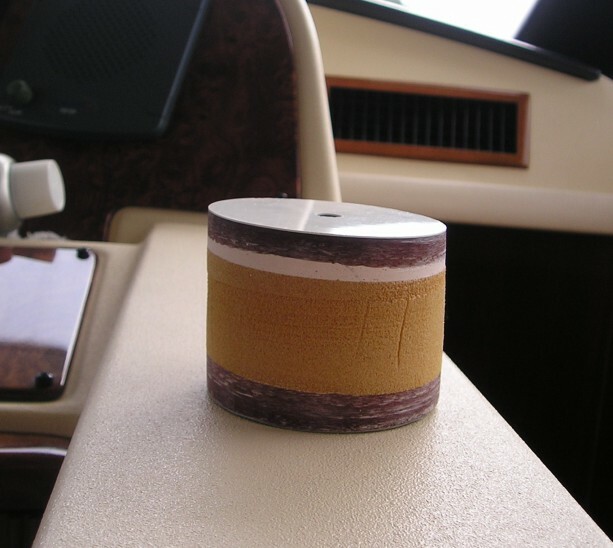 Meridian History & Updates; the first year (2003) the Meridian 490’s were introduced they actually were just leftover 2002 4788’s models with teak interiors, with the HIN number changed (which can be easily seen on the first 03 models). 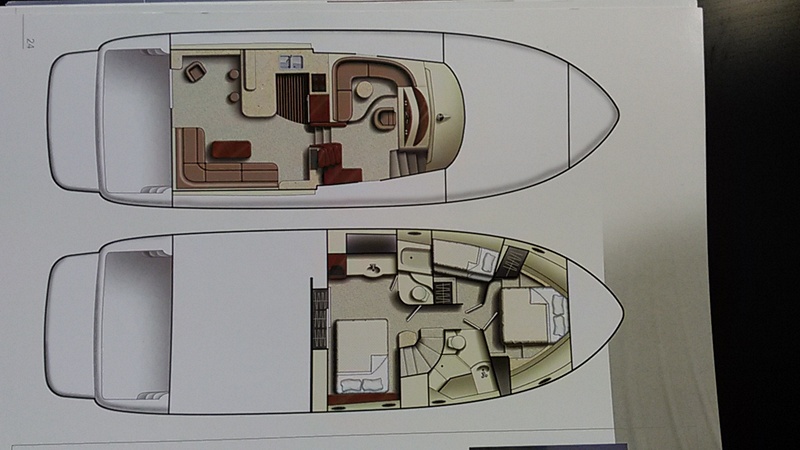 The portlight shapes are different in the hull, as are the engine air intakes. Other than that…pretty much identical exteriors. I had clients attempt to purchase new 03 Meridians back in 03. The dealers stood firm at $530k no matter how hard they tried to buy for less. Surprisingly enough -none of the new 490’s had the high gloss Cherry Wood interiors everybody loved about the 2002 4788’s. The salon TV’s on Meriidan 490’s no longer have a cover, so you always have a “glass eye” staring at you. Their prices were substantially ($150k dealer cost) higher than what the 02 Bayliners. Brunswick did a major dealer “sweep” in 2002 and eliminated many long time Bayliner dealers from selling this “new” line of boats, instead having many Sea Ray dealers market these vessels. 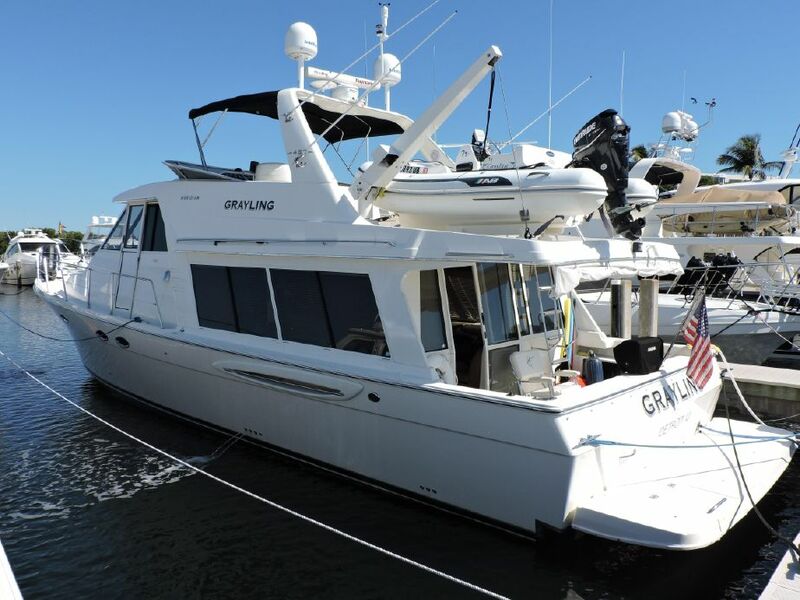 As you can imagine this threw this market in total disarray as most Sea Ray dealers who had been selling Sea Rays, sometimes literally across the street from Bayliner Dealers for decades, now all of a sudden were being instructed to promote a boat they had spent years selling against. It’s safe to say it caused a lot of confusion in the boat market and sales were sporadic as there was huge buyer reluctance to pay hundreds of thousands of dollars more for basically the exact same boat (minus standard features of a 4788) it had replaced only months earlier. 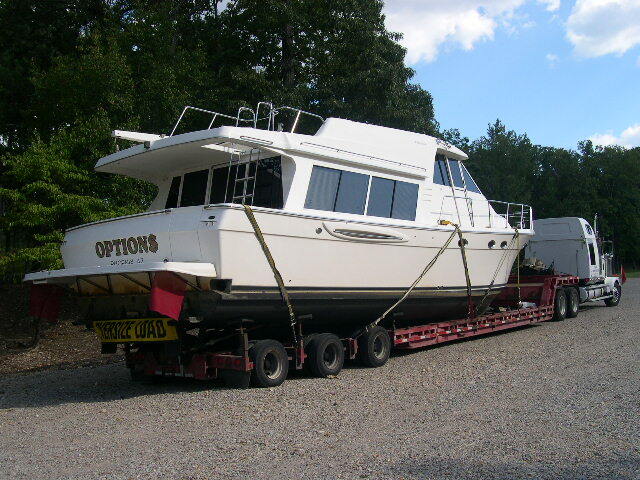 2003 Meridian 490 with a serious tender on TNT lift. Drive on, drive off. 2003 custom upgraded Meridian 490 This was the coolest 490 I’ve yet seen. Serious $$$$ was spent on her when new, and since. Yes, she’s had at least one new engine (that I’m aware of), because that’s a lot of weight to push with 330 hp engines, and her original owner ran her BALLS TO THE WALL. 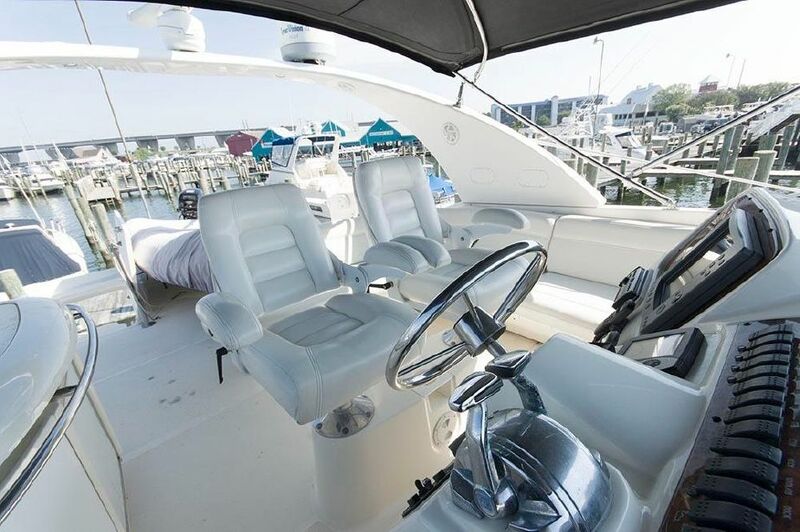 2007 Meridian 490 with the electronic smokeless quiet 380 hp engines. 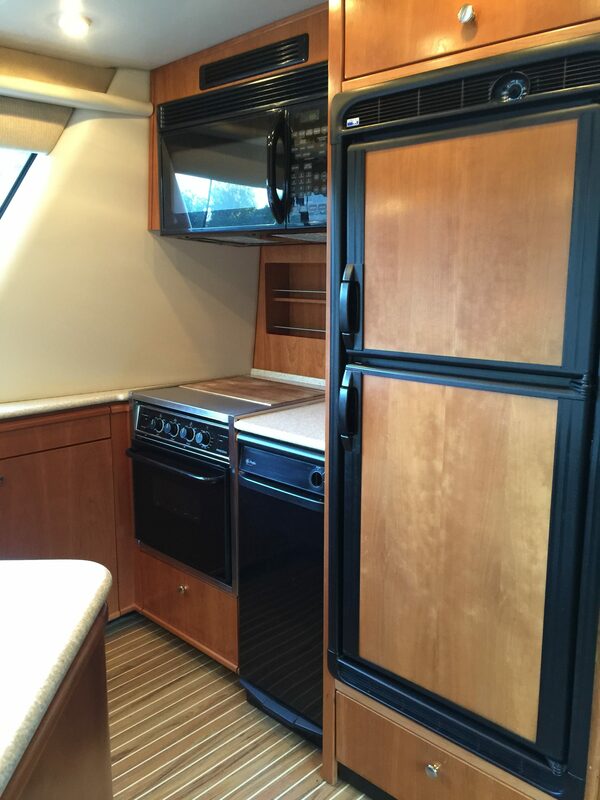 2004 Meridian 490 w/custom hardtop. THIS is why the Meridian 490’s cost more than the Bayliner 4788’s they replaced. It’s the fit and finish. It’s the higher grade soft goods, hardware and fixtures. the 2004 and 2005 490’s have the light colored countertops. Florida residents can legally leave their purchase here in Florida for 90 days without Florida sales tax being due. 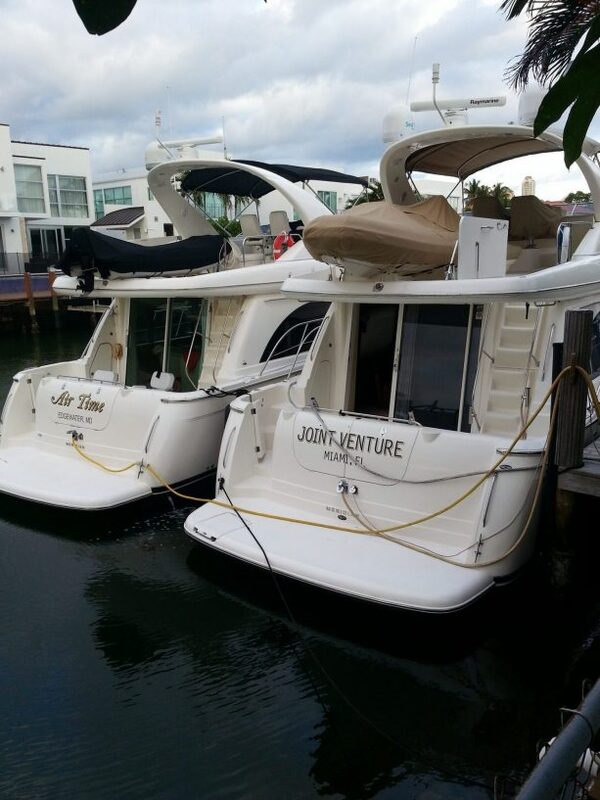 You can buy another 90 day decal, which mudy be purchased from a Dealer or Yacht Broker at time of purchase that allows a buyer another 90 days on top of the original 90 days- for a total of 180 days. 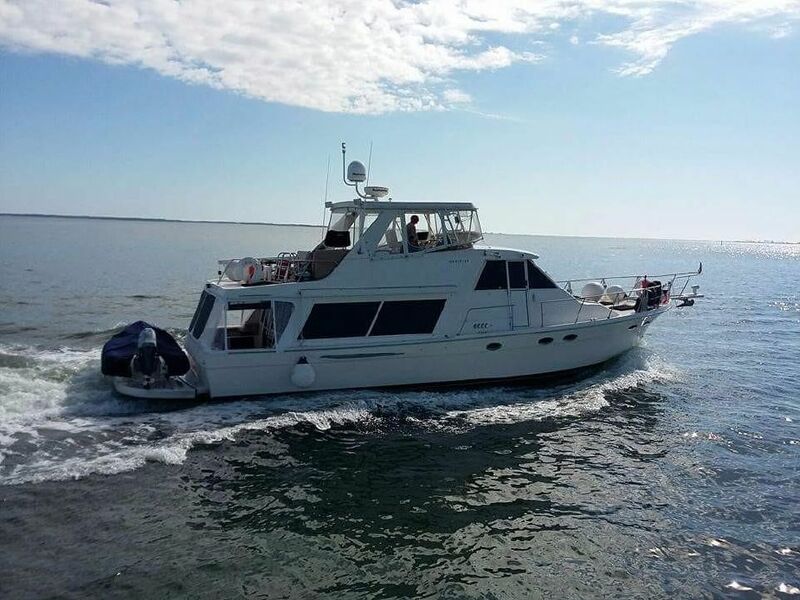 So-fly here, cruise the Bahamas (45 miles from America), the Keys, or Cuba (90 miles from Marathon or Key West) and experience crystal clear water while enjoying your new yacht. Don’t be in such a hurry to return to opaque water. 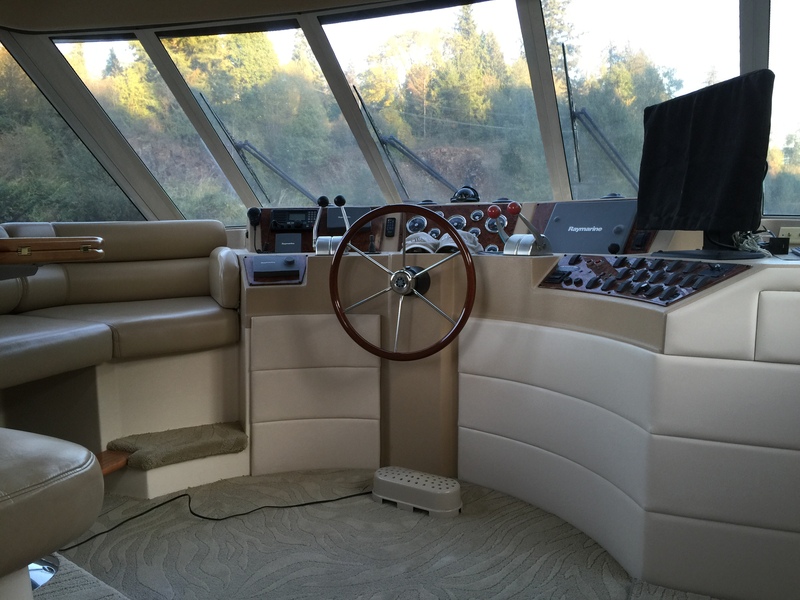 The Meridian Pilothouse Motoryachts were all built in the Washington State plant. The 490’s were trucked directly to their dealers, but the 540’s and 580s were trucked to Galveston Texas where they were assembled then run on their bottoms to the East Coast Dealers when new. SOME may have also been trucked to their dealers in the Midwest. 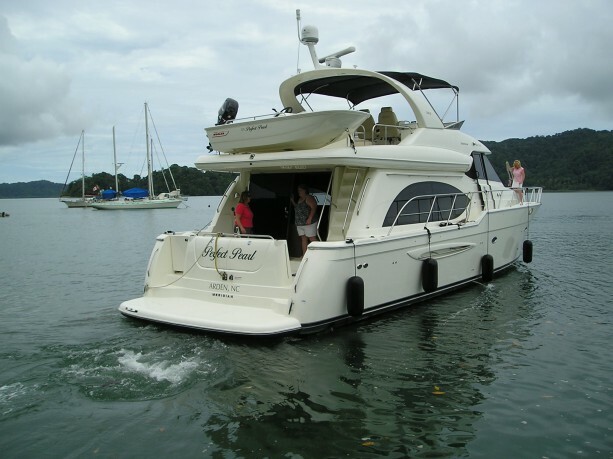 The 540’s and 580’s will require MUCH more in decommissioning to truck than the smaller boats but these boats are quite capable of running on their bottoms pretty much anywhere coast wise (or across the Caribbean) if you have the time. OR VIA SHIP -I’m finding that with the higher and higher prices of trucking, it now makes sense if your going coast to coast to just use SHIPS (link on front page) . It’s almost the same kind of money as trucking, plus the boat does not need to have any thing taken apart. They can drop you off in Costa Rica , Mexico, or British Columbia Canada. I’ve recently (2014) sent 4788’s and 490’s from Ft. Lauderdale- to New Zealand and Australia from $35k to $50k. In 2016 a 5788 went to New Zealand from West Palm Beach for $75k . SHIPPING PRICES is all Supply and Demand so please contact the shippers direct (links here on my site). 2014: Dockwise and Seven Star have merged. 2016: I’ve been told that the normally scheduled ships from the USA to Australia and New Zealand are on hold until further notice due to the low demand due to Australia’s economic problems, plus the strong US dollar, which has now made American goods quite pricey. Note that the air intake covers on the 490 Meridian extend past the rub rail. This is the reason the Meridians have their beam listed at 15’01” while the Bayliners are 14’11”, it’s solely the engine air intake vent covers. If your going to truck a 4788 or 490 you need to get it down to this height as shown in the photo below. 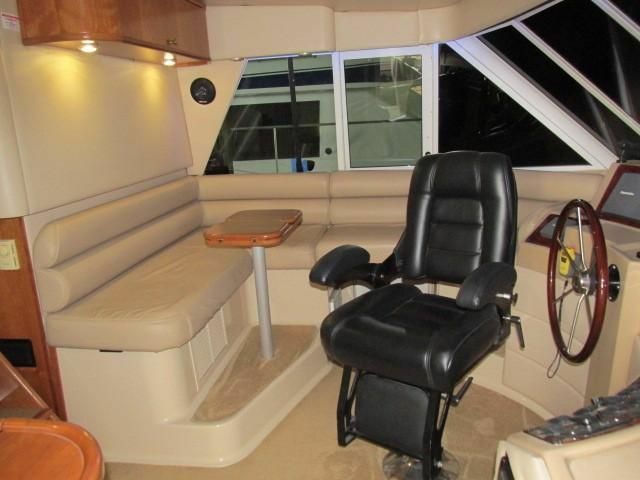 The following must be brought down to do so: arch, flybridge windshield, the steering wheel pod, and props. Most all were brought from the factory like this. They were DESIGNED to be trucked so it’s no “big deal” (other than a lot of 5200 has to be removed and replaced). Expect to pay at least $3k at each end for a yard to take it apart, and to reassemble. Don’t forget these expenses when a trucker gives you quotes. ALL the truckers I used to use (who dismantled, prepped, trucked, and reassembled) for trucking these boats got out of the boat transport business years ago when all the manufacturers went out of business, whilst at the same time it became cheaper for a buyer to use SHIPS from Florida to the West Coast of America. Therefore I no longer have any particular truckers I can recommend. Meridian 580 that arrived 12/15 in Florida via truck from Ohio waiting to have it’s bridge reassembled. Originally quoted $28k, it ended up costing almost $50k. I could had told them that. 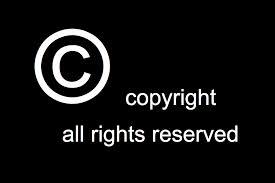 This page and information is copyright protected.